Discount Auto Glass, you are going to LOVE this. My name is Matthew Rupp and I am exceptionally skilled when it comes to helping companies to improve their online presence and to make sure their names appear in the top search results on Google. Established service businesses (such as body shops, dentists, or local exterminators, for example) are my specialty. I have given a number of presentations to hundreds of business people on the subject of local SEO. I have created in-depth case studies detailing how my team and I would help a number of local companies dominate Google in their area. I have helped increase search engine rankings and website traffic for a number of successful companies. I am currently writing a book on the subject of digital marketing for service businesses. My goal is to have this published by August of this year. I love what I do! I do work I enjoy with clients I like who trust me to put their websites to work and grow their bottom lines. I was first introduced to Discount Auto Glass (http://www.discountautoglass.net/) by my good friend and mentor, Sam Moyers, who asked me to take a look at the company owned by his long-time friend. I was referred to Brittany, who explained they currently have a company they are happy with that handles their website, social media, and search engine optimization. Upon looking at their website and social media presence, I was a little surprised, to be honest. The potential to improve the traffic, the rankings, and the conversion rate for this business is truly outstanding. I could make a list a mile long of things that could be done to improve their rankings, traffic and conversion rate. Therein lies my dilemma; if the client is happy with who they are with now, how do I help them see how much happier they COULD be? Let me guess—when I say things could be ten times better for this company when it comes to their internet presence, you thought, “Of course he is going to say that.” But it’s true. I spent the last couple weeks trying to figure out the best way to show this company how much they could benefit from working with somebody like me and how much their website traffic could increase. A 1000% increase in traffic may sound unbelievable, but it’s realistic–I just have to help the leaders of this company see that. A) They are in Missouri and I am in Kansas. B) I come highly recommended, but they haven’t met me in person. C) They are happy with the company they are with now. So I’ve decided that I will prove it. I will provide a series of genuine GAME CHANGERS: specific strategies and tactics that I know from experience will have a significant impact on the rankings, traffic, and conversion rate of the Discount Auto Glass web presence. No cost, no obligation on their part. That’s how confident I am that I can significantly increase their bottom line. This business is in the PERFECT niche for me to bring them the most value. Let me tell you a quick story to clarify WHY I say that. Part of my wife’s birthday gift last November included having her Toyota Highlander detailed and getting the plastic/rubber cover on the console between the seats up front (which had a small hole in it) reupholstered. On my way to the detail shop to drop off my wife’s car, I Googled “upholstery shop” on my phone while I was stopped at a red light. What came up? 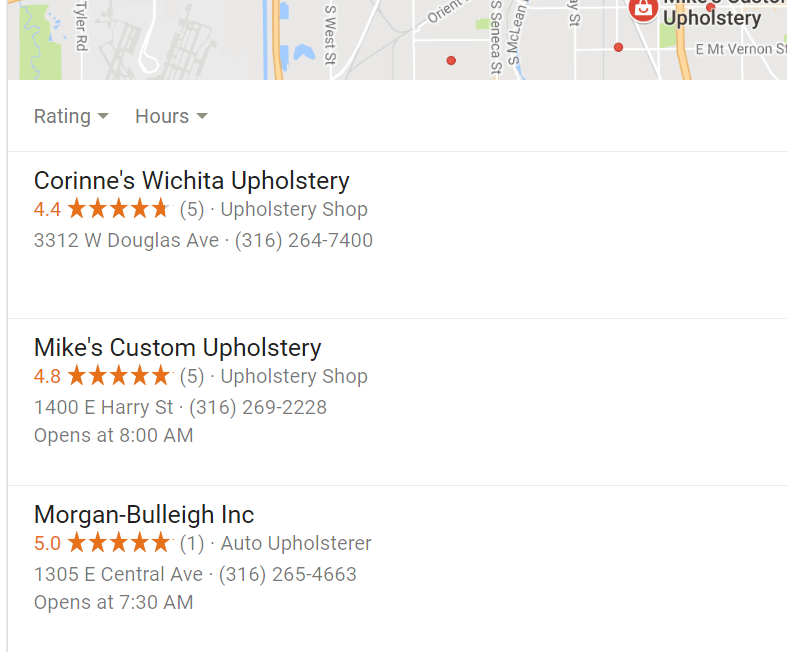 There were three results in what is called the “local pack,” the top 3 LOCAL results for upholstery shops here in Wichita. The local-pack results are the key to one of the BIGGEST ways I can help Discount Auto Glass—but we will come back to that. That day, after the red light turned green and I continued on my way, I called all three of the upholstery shops shown in the local results. The first person I spoke with told me it would cost $120 to recover the console and he could have it done in a day. That seemed pretty expensive for such a small area to cover, so I called the next company. This time I was given an estimate of $125. When I called the third company hoping to find a lower price, I was told it would cost $135-150. Even worse, they wouldn’t be able to get to it until the following week. Suddenly that $120 reupholstering in 24 hours seemed downright reasonable and my decision seemed easy. I was sold. I ended my search and took my wife’s car to the first company I’d called—the first listing in the local search results. If you aren’t the top result, this system may seem lousy and somewhat unfair, but the reality is that those search results matter. The scenario I just described repeats itself millions of times all over this country every hour of every day. People are impatient, often in a hurry, and they rely on their phones more and more. People use their phones for everything now—dating, shopping, research, connecting with friends, tracking their kids, managing their money, and so much more. If they need to deal with something immediately, like a cracked windshield, for example, or they need something repaired, moved, painted, fixed, or detailed, what is the first thing they do? They pick up their phone, do a Google search, and call the top 1–3 companies in the local results. Most of the time, that’s it; after just a phone call or two, they’ve booked an appointment, scheduled somebody to come to them, or made a decision about whether or not to give the company their business. So if a company is not at the top of those results, it doesn’t matter how high the quality of their services is—if they’re not getting the call, they’re not getting the customer. Of course, there are exceptions. If a person is hiring a divorce attorney, looking to choose a roofing company, or considering making a large purchase (like a boat, for example), they will most likely do more extensive research or ask a friend for a recommendation. It wasn’t until a week after my wife’s birthday that it hit me. 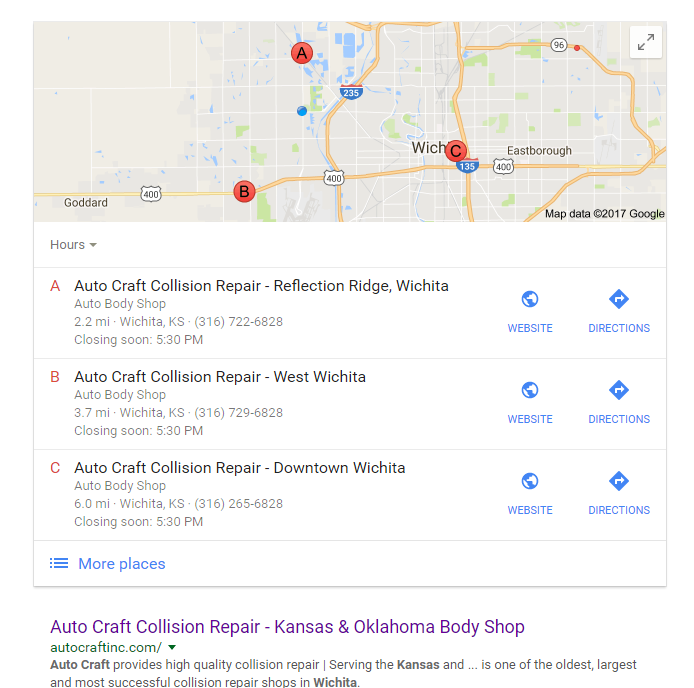 Aside from the companies that appeared in the all-powerful top results on Google, how many upholstery shops are there in Wichita? Think about that and consider how many people do the exact same thing every day. There are at least EIGHTEEN upholstery shops right here in Wichita, not counting the top three that are getting the lion’s share of the leads. It’s a zero-sum game. There can only be one. 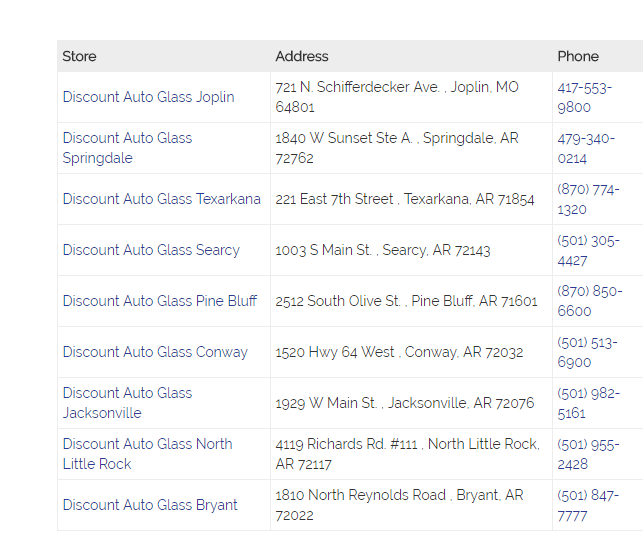 Lumping all nine of the Discount Auto Glass locations on one page rather than giving them their own pages, which would make it clear that each one is a free-standing location that “deserves” to come up in local search results, greatly hurts their chances of showing up in the “local pack” I touched on previously (the top 3 results on Google). As a result, it’s costing Discount Auto Glass an incredible amount of traffic and potential sales. If there isn’t a lot of competition for those top 3 spots then yes, Discount Auto Glass may show up in the top 3 in those areas. But as Google moves more and more toward personalized results and uses the “near me” feature, it will become harder for Discount Auto Glass to win by default. 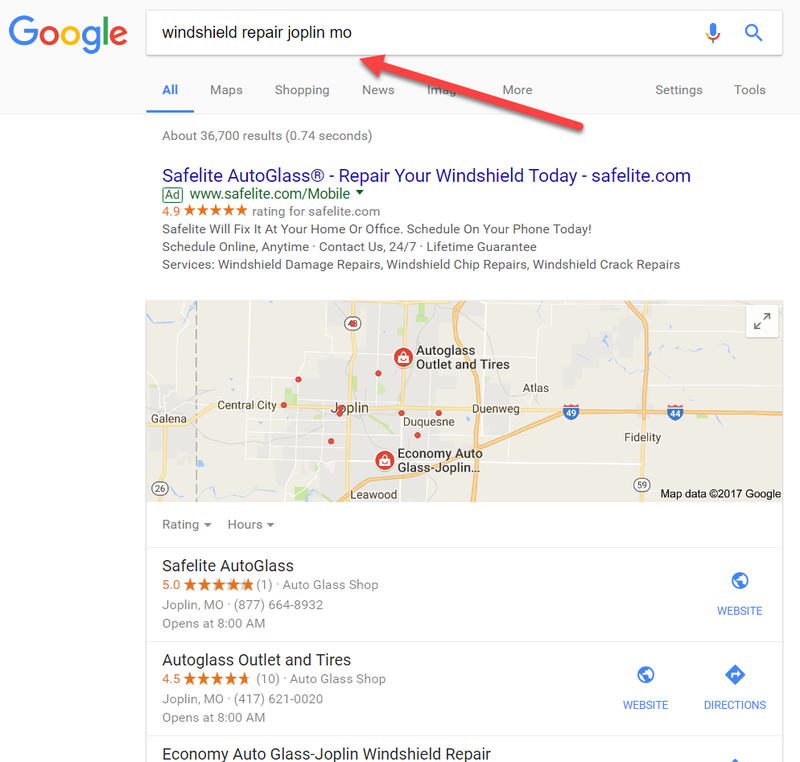 What needs to be done to significantly increase the website traffic for Discount Auto Glass? Giving each location its own page and, just as importantly, “building legs” under it similar to what a client of mine did with multiple locations (http://autocraftinc.com/locations-auto-craft-collision-repair/) is a good start. This makes a solid connection to the state, city, and even the specific community the location serves. If you want to see this in action, just Google something from home and then from somewhere across town—you will see different results. Google often knows where you are, so if you search for “dentist,” it will show you dentists close to your location. So when somebody searches “Mexican food,” it’s not hard for Google to surmise that they probably don’t want to drive 20 minutes when there are four Mexican restaurants that are closer. High-quality service, qualified employees, and a good business model go a long way when it comes to growing a successful company. But imagine how well that same company would do if it had an aggressive, focused local SEO campaign working for them! Discount Auto Glass is already a successful company, but I believe it has incredible unrealized potential for growth. I have several more GAME CHANGERS lined up, so stay tuned next week!